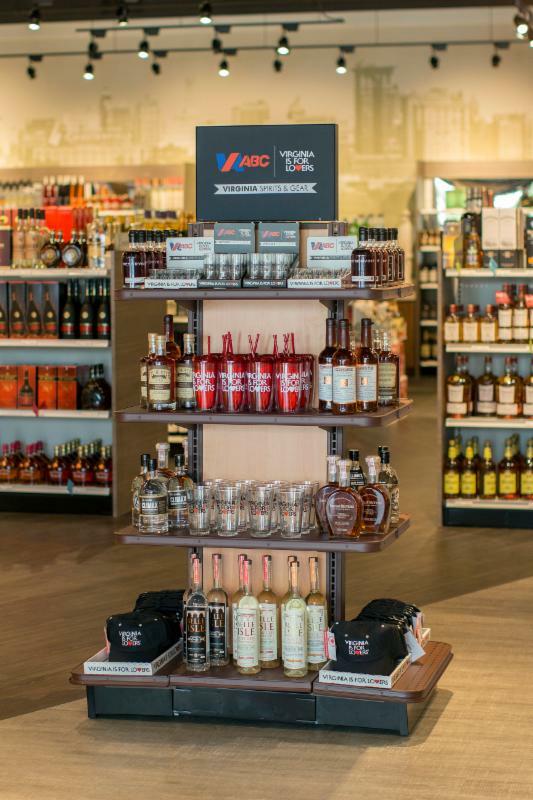 RICHMOND – Virginia distilled spirits, wines and mixers are now sharing shelf space with Virginia is for Lovers merchandise at the Virginia Department of Alcoholic Beverage Control’s (ABC) four premier stores. The new items will each bear the popular Virginia is for Lovers logo, the state’s iconic travel brand first used in 1969. The partnership between Virginia ABC and the Virginia Tourism Corporation to sell state tourism merchandise in the ABC stores was launched with legislation passed by the 2016 General Assembly and signed into law earlier this year by Governor Terry McAuliffe. Virginia ABC is stocking the items on special display shelves in select stores located in Williamsburg (1244 Richmond Road), Leesburg (506A Fort Evans Road N.E. ), Virginia Beach (1612 Laskin Road, Suite 774A) and Short Pump (3450 Pump Road Suites 21-22). This is the third time Virginia ABC has teamed with Virginia Tourism since 2015. Last year, a summer partnership between the two agencies offering Virginia is for Lovers trucker hats with every purchase of Virginia wine and spirits at select stores resulted in an almost 116 percent increase in sales of Virginia-made products. When the UCI Road World Championships bicycle races came to Richmond last September, 35 metro-area ABC stores offered a free Virginia is for Lovers cowbell-the noisemaker of choice for professional cycling events-with purchase of a 750mL or larger bottle of Virginia-made wine or craft spirit. “Virginia ABC is proud to stock the shelves of its premier stores with Virginia is for Lovers products and especially pleased to be able to once again partner with Virginia Tourism on a retail project,” said Virginia ABC Chairman Jeffrey Painter. The Virginia is for Lovers items chosen for sale in Virginia ABC premier stores can also be purchased online at http://www.thevastore.com. The Virginia Department of Alcoholic Beverage Control (ABC) is a major source of revenue for the commonwealth, contributing more than $1.8 billion to the general fund in the last five years. The agency currently operates 359 state stores. Its Bureau of Law Enforcement oversees more than 17,000 ABC licensed establishments while the Hearings and Appeals Division considers more than 700 cases each year. The agency also provides alcohol education and prevention programs for people of all ages. ABC is committed to progress and innovation in carrying out its control, service and revenue mission.